Anyway, around 1:30 am on March 27th (the day after my due date) I woke up to contractions that were coming 10 minutes apart. They lasted the rest of the night and stayed consistent. Then once I got up for the day and started moving around they slowed down a lot. *sigh* I was so grumpy about this! My husband ended up coming home early because he knew I was having a hard time and by lunchtime the contractions started picking up and were around 5 minutes apart all day long. We debated whether to call the Dr or go to the hospital for forever! I didn’t want to go too soon and be sent home, plus I was going for a natural delivery so I didn’t want to be admitted too early. Around 4:30 pm we finally decided to take Walker to my mom’s house and head to the hospital. We got there around 6 pm when my contractions were getting hard to walk through. When they checked me I hadn’t progressed at all since my appt two days earlier!!! Ahh I was so frustrated!!! I knew this was the beginning of the real deal though so I didn’t get too upset. We ended up getting food on the way home and I labored in the bathtub for awhile. Contractions were definitely getting stronger and closer together. Then around 10 pm my water broke and we decided to head back to the hospital. When I was checked at 11pm I was 4.5 cm, but she said my water hadn’t broke yet. What?!? I didn’t just pee clear liquid all over the place! Anyway, apparently I had a fore bag of water which is like an extra bag or something. By this time contractions were coming 2-3 minutes apart and I was progressing fairly quickly until about 2 am when I hit 7-8 cm and my dilation seemed to slow down. I knew that around 7 cm is when you go through transition (i.e. the hardest and normally shortest part of labor) so I figured things would pick up and I’d have my baby soon. By this point my contractions were 1-2 minutes apart and becoming really unbearable!! I was having a hard time managing them and I was screaming lots of crazy things. Somewhere around 3 or 4 am I decided to get a shot of medicine that would calm me down and help take the edge off of the pain. Let me tell you I am so glad I did! It helped just enough to relax me (and let me eat a yummy orange popsicle) for about an hour or so and by the time it was wearing off I had progressed to a 9. Also, baby was low and my bag of water was bulging so I asked for them to break it. Soon after they broke my water I was a 10 and it was time to push. I pushed through 4 or 5 contractions and at 5:48 am my baby girl was born! Let me tell you pushing a baby out is completely surreal and crazy!! 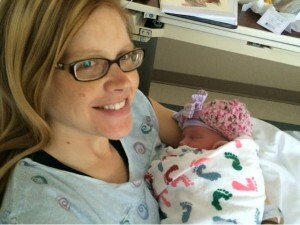 I was so relieved that it was all over and I couldn’t believe that I had done it without an epidural! Thank God that everything went smoothly and everyone was healthy! My two biggest prayer requests for this birth were that I would go into labor on my own and be able to have an intervention free natural VBAC which I did. God is so good!! Glad you were able to have a great experience! Hope you are having a wonderful time holding the precious baby and still keeping up with the little man! Yay! I've been waiting for this post! :-) So glad everything went so well, even if it was a little long... Congrats again on your beautiful baby girl! I really enjoyed reading this! I'm so glad you were able to have a successful VBAC! I found your blog through life of faith's blog and I loved this story! Congratulations on a successful, natural VBAC! I have never heard of that shot before... do you remember what it was? Hi Amanda! I'm so glad you stopped by! I believe the shot was "Fentanyl." I hope that helps!